Size: 7mm x 100mm, will fit 20-30w glue guns (mini glue gun). Material: safety EVA, non-toxic and environmental. Film toughness, makes crafting easier. 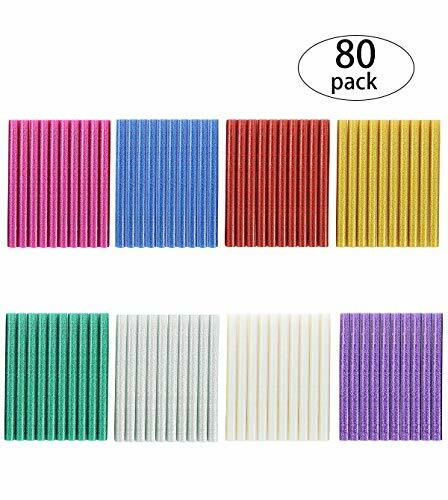 Package: 80pcs mini glitter glue sticks per package, 8 glitter colors in total, 10pcs for each color, perfect for arts crafts & hobbies, general repairs and gluing. Have Good Adhesion: used in metal, wood, glass, card, fabric, plastic,ceramics, carton sealing, crafts adhesive, electronic appliances and other adhesive. AFTER SALE MAINTENANCE AND CUSTOMER SERVICE: Our company provide 60 days warranty service.So feel free to contact us if you have any question. If you have any questions about this product by SBYURE, contact us by completing and submitting the form below. If you are looking for a specif part number, please include it with your message.